Senator Ritchie is pictured with Edith Marie Switzer Cox. PULASKI, NY – State Senator Patty Ritchie recently visited the Pulaski Public Library, where she presented longtime library volunteer Edith Marie Switzer Cox with a proclamation for her service to the community. 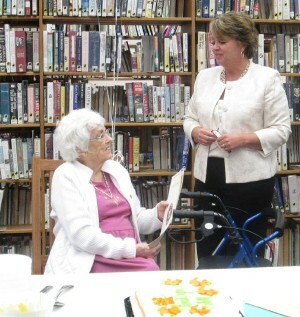 Edith is 93 years old and has volunteered at the Pulaski Public Library for 50 years; working behind the scenes two days every week to help the library become an educational and cultural center.